Wasting no time in following up his debut full-­‐length, the blisteringly brilliant Interstate from 2014, griff has completed ten new intricately produced and thoughtfully arranged tunes that sit somewhere between cinematic sunset music and chilled mid-­‐tempo breaks . Collected under the title of Unstuck in Time, the album unfurls slowly to reveal its deep beauty, like a cactus blossoming in the desert. "Missing Pages" starts proceedings off on a slow, deep tangent: a contemplative, dub-­‐tinged guitar number that elevates to snappy breakbeat, but where the album goes from there is anybody's guess. 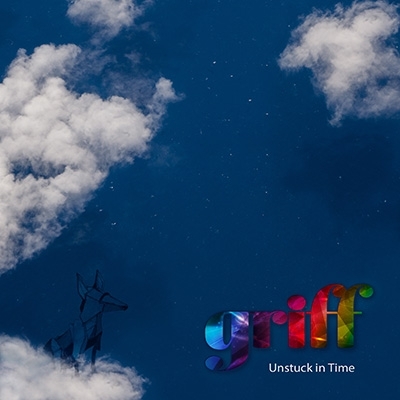 Unstuck in Time melds moments of cartoon lunacy (dig the happy-­‐go-­‐wompy "Panoramica"), mysterious poly rhythmic funk outs (considering the spy-­‐like bassline, groovy drums, and densely atmospheric piano of the Dersu Uzala assisted "Ghosty"), and even a little drum and bass (get lost in the fluid groove of "Trial & Error") all together into one supreme electronic music experience. "Deep Field" starts off on the ambient side, building to electric piano and delayed guitar strums laid out over a loping downtempo breakbeak with swirling atmospheric effects until the mood suddenly switches to the kind of warped funkiness we've come to expect from Omelette Records releases. It then returns to the emotionality of the intro as it drifts to its conclusion. "Bled Dry" ignites with desert plains guitar, reversed and delayed, snappy percussion, and subtly grumbling bass, with elements of dub cropping up in the mix under the provocative vocals of Luke Sabbadini, but the feel pushes drum and bass by the end. The Kepler mix of "Orbit" takes the opening track from Omelette Records' Swarm Theory compilation from its quirky worldly sounding original to a nervous, broken circuit realm with more cowbell. These tracks all speak volumes as to the aesthetic complexity of the album. With this kind of emotional resonance and genre variety, Unstuck in Time never sounds rushed or forced. In fact, griff makes it all sound so easy, so organic and natural that you might imagine he simply tossed some musical seeds over his shoulder and turned around to find a complete salad sitting there, but we know better. It took a lot of brilliance and dedication to make such a rich and varied album come together so perfectly.